Want to be notified of new releases in sakaki-/raspbian-nspawn-64? Bootable RPi3 (B and B+) image with 64-bit kernel, 32-bit Raspbian Stretch 'Desktop' host OS, 64-bit Debian Buster guest OS in lightweight, autostarted systemd-nspawn container. This project is a bootable, microSD card 64-bit kernel, 32-bit Raspbian Stretch 'Desktop' host OS + 64-bit Debian Buster guest OS image for the Raspberry Pi 3 model B and B+ single board computers (SBC). 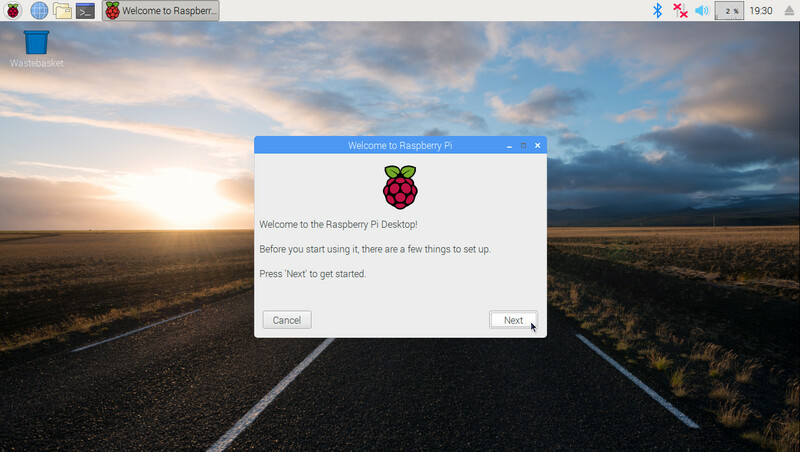 It is intended for users who would like to retain their familiar Raspbian tools, desktop and repos, but who also need to run one or more 64-bit only software components on their Pi. The guest 64-bit Debian OS is automatically started each boot inside a systemd-nspawn container. Using a provided System Tools menu item, you can easily open a 64-bit shell inside this container (to install new 64-bit packages, for example). 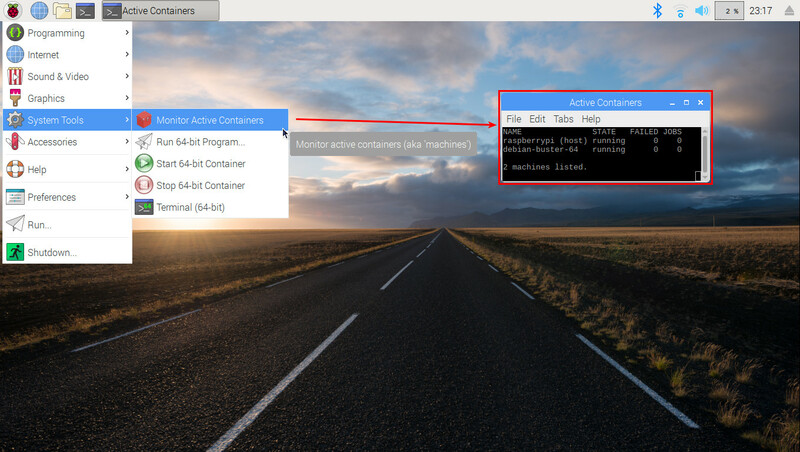 Another menu item allows you to easily run 64-bit applications in the container, correctly set up so they display on the Raspbian desktop, can play audio, and have access to the current user's home directory. Due to the containerization, such apps are however prevented from performing many harmful actions on the host (this is not just a chroot). Package management in the guest uses the familiar apt-get, with the full Debian aarch64 repository available, and day-to-day Raspbian operation (with the exception of anything needing e.g. MMAL or OpenMAX IL) is pretty much per the stock image. WiFi, Bluetooth, I2C etc. all work, and 32-bit Raspbian apps can be installed and used just as on a regular RPi3 system. As of version 1.1.0, launchers for 64-bit apps are automatically added to the 32-bit host's menu upon installation in the guest, and changes to 'regular' users (existence, password and primary group) are automatically reflected through from host to guest, for convenience. And, as of version 1.2.0, changes to timezone or locale in the host are automatically propagated to the guest too. Also as of version 1.2.0, the 64-bit kernel is supplied via a Debian package (courtesy of ShiftPlusOne). The image may be downloaded from the link below (or via wget, per the instructions which follow). Please read the instructions below before proceeding. Also please note that all images are provided 'as is' and without warranty. You should also be comfortable with the free and non-free licenses required by firmware, boot software and OS packages supplied on the image before proceeding: these may be reviewed here. Also, please note that this is an unofficial, user-driven respin of Raspbian, and as such is not endorsed or supported by the Raspberry Pi foundation. That being said, no fundamental changes have been made to either the host Raspbian OS or guest Debian OS. You can read a detailed account of how this image was created on the Raspberry Pi forums, here. It is sensible to install this image to a separate microSD card from that used by your default Raspbian system; that way, when you are finished trying it out, you can simply power off, swap back to your old card, reboot, and your original system will be just as it was. A microSD card of at least 8GB capacity (the image is 932MiB compressed, 5.05GiB == 5.42GB uncompressed, so it should fit on any card marked as >= 8GB). Class A1 or A2 cards are particularly recommended, but not required. I have found most SanDisk cards work fine; if you are having trouble, a good sanity check is to try writing the standard Raspbian 32-bit image to your card, to verify that your Pi3 will boot with it, before proceeding. 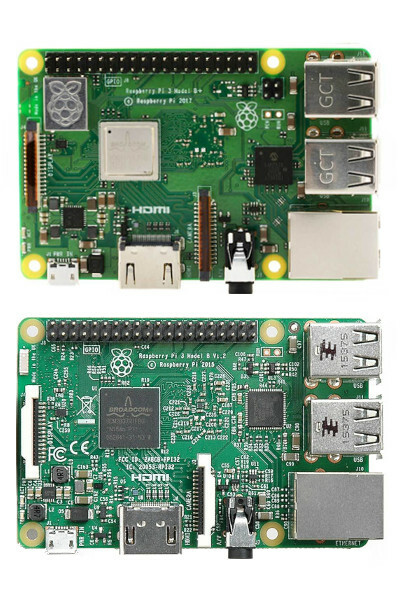 A Raspberry Pi 3 Model B or B+ (obviously!). For simplicity, I am going to assume that you will be logging into the image (at least initially) via an (HDMI) screen and (USB) keyboard connected directly to your Pi. A decent power supply is recommended. A PC to decompress the image and write it to the microSD card. This is most easily done on a Linux machine of some sort, but it is straightforward on a Windows or Mac box too. If you are using a Windows or Mac box, or prefer to use a GUI tool in Linux, I recommend you download your preferred image via your web browser using the link above, and then check out the free, open-source, cross-platform tool Etcher to write it to microSD card. Then, once you've done that, continue reading at "Booting!" below. to fetch the compressed disk image file (~932MiB) and its signature. Warning - this will destroy all existing data on the target drive, so please double-check that you have the path correct! As mentioned, it is wise to use a spare microSD card as your target, keeping your existing Raspbian microSD card in a safe place; that way, you can easily reboot back into your existing Raspbian system, simply by swapping back to your old card. If, on your system, the microSD card showed up with a path of form /dev/mmcblk0 instead, then use this as the target, in place of /dev/sdX. For this naming format, the trailing digit is part of the drive name (partitions are labelled as e.g. /dev/mmcblk0p1, /dev/mmcblk0p2 etc.). So, for example, you might need to use xzcat raspbian-nspawn-64.img.xz > /dev/mmcblk0 && sync. The above xzcat to the microSD card will take some time, due to the decompression (it takes between 5 and 25 minutes on my machine, depending on the microSD card used). It should exit cleanly when done - if you get a message saying 'No space left on device', then your card is too small for the image, and you should try again with a larger capacity one. Note that on first boot, the image will automatically attempt to resize its root partition (which, in this image, includes /home) to fill all remaining free space on the microSD card. Begin with your RPi3 powered off. Remove the current (vanilla Raspbian or other) microSD card from the board (if fitted), and store it somewhere safe. Next, insert the (raspbian-nspawn-64) microSD card you just wrote the image to into the Pi. Apply power. You should see the RPi3's standard 'rainbow square' on-screen for about 2 seconds, then the display will go blank, and the system will perform its first-time boot actions (including resizing the root partition and filesystem to fill the available free space on your card). Due to the vc4-fkms-v3d graphics driver in use, the screen may be blank for much of the initial boot (although there will also be intermittent console output), so please be patient. If you see the message dmi: Firmware registration failed. displayed, this may safely be ignored. Follow though this dialog (overview here); you will be prompted to reboot once complete. Do so, and wait for your system to come back up. Note that as of version 1.1.0 of the image, the password you set via the wizard for the pi account in the 32-bit Raspbian host will also be automatically reflected for the 'shadow' pi user inside the 64-bit Debian guest OS (and this will hold true for any subsequent password or user changes made while the container is running). Also, as of version 1.2.0 of the image, changes to locale and timezone in the host will also be automatically propagated into the guest. NB - if your connected computer monitor or TV output appears flickering or distorted, you may need to change the settings in the file config.txt, located in the microSD card's first partition (this partition is formatted vfat so you should be able to edit it on any PC; alternatively, when booted into the image, it is available at /boot/config.txt). Any changes made take effect on the next restart. For an explanation of the various options available in config.txt, please see these notes (the shipped defaults should work fine for most users, however). You can also use the bundled GUI tool to modify (some of) these settings: it is is available under Preferences→Raspberry Pi Configuration. In particular, if the display appears to be inset by a black border, so it is not using the full screen real estate (this mostly happens when using monitors, and newer HDMI TVs), turn off "Underscan" (via the Raspberry Pi Configuration tool just mentioned), and reboot. But, since your new raspian-nspawn-64 image uses an RPi3-aware 4.19.y 64-bit kernel (based on this build), and has a full Debian Buster 64-bit (aarch64) guest OS started inside a systemd-nspawn namespace container automatically at boot, installing and using 64-bit packages is now just as straightforward! systemd-nspawn --boot is similar in some ways to a chroot, but more powerful. Under it, the guest OS is fully booted as an independent entity - it has its own systemd init, running as PID 1 in an isolated process namespace, so e.g. scheduled tasks and programs requiring dbus interaction can be run, but processes in the container's host's OS are invisible inside it, enhancing protection. The full file system hierarchy is virtualized, as are the IPC subsystems and the host and domain name. As we have it set up here, networking is not virtualized (for simplicity), so guest OS processes may directly use the host OS' network adaptors, making it straighforward to run e.g. 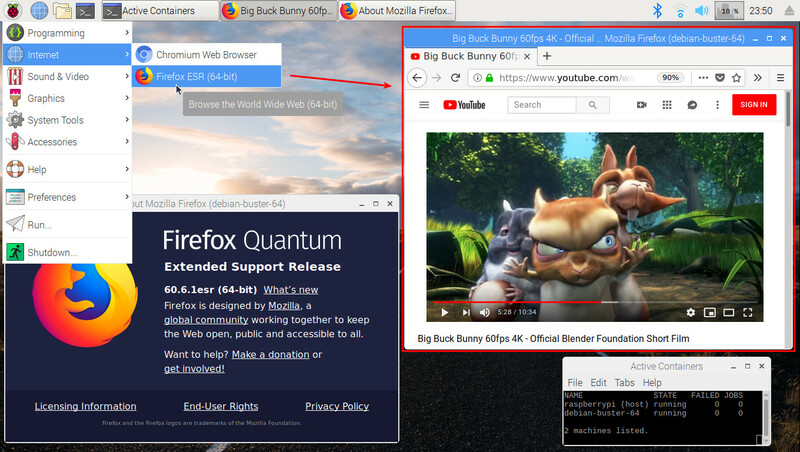 a web browser inside the container (and indeed the image ships with a 64-bit version of Firefox-ESR). Additionally, systemd-nspawn limits access to various kernel interfaces in the container to read-only (such as /sys, /proc/sys, etc. ), and prevents the creation of device nodes and loading of kernel modules. The host system also cannot be rebooted from within the container. For further background on the main underlying Linux container technologies (viz. : namespacing, seccomp-bpf and capabilities) leveraged by "concessionaire" apps like systemd-nspawn, firejail and docker, see e.g. my notes here, here and here (of course, other facilities such as cgroups are also used). Note that containerization, while stronger than chroot-ing, is not KVM: the host and guest OSes share a common (64-bit, of necessity) kernel. However, on the upside, it is extremely lightweight (while still providing strong isolation): in quicesent state, the booted Debian Buster system takes less than 10MiB of system memory, for example, and consumes almost no CPU. Also, for avoidance of doubt, under this approach both 32-bit host and 64-bit guest OSes will run natively, without emulation. So, let's now review how to carry out some key tasks on your new system. NB: unlike prior releases, as of v1.1.0, the default pi user is no longer 'special': if you add a new user to your system (with 1000<=uid<1100), the same menu options and home filesystem access within the container will be available for them (you must ensure your new user belongs to the sudo group, as pi does, to avail yourself of this however). 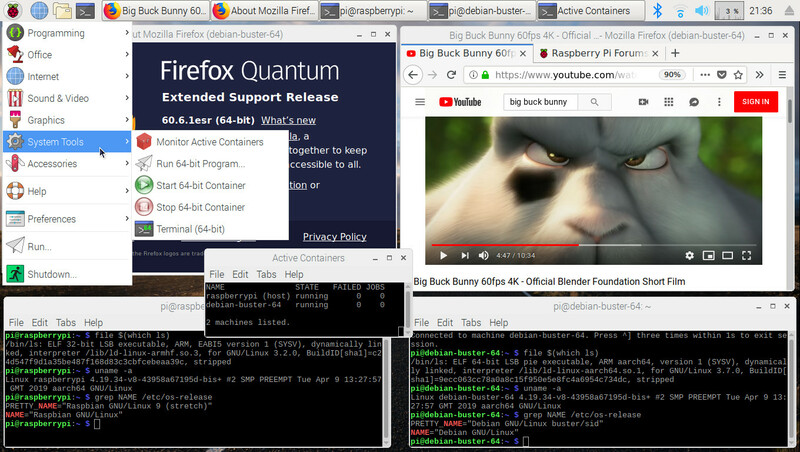 Provided you see two containers (aka 'machines') listed as shown above (i.e., raspberrypi (host) and debian-buster-64), with both showing state running (rather than degraded, which implies there are failed units), all is well. There is no need to keep this monitor window open to use the guest OS, although of course you can if you wish. This works because the pi user's home directory, which includes the necessary .Xauthority, is bind-mounted into the guest container (which has an identical uid/gid pi account), and because the host OS's X11 Unix abstract domain socket is still visible (since network namespacing is not in use). As of v1.1.0 of the image, this will also work for any other 'regular' user you create. and another, similarly sized clock should appear (but this time with an orange face); the app will keep running even if the Raspbian shell is closed. Notice how user pi's home directory is visible (and writeable) by the pi user inside the guest OS, as the container startup configuration bind-mounted /home. Most other directories on the host are either inaccessible or read-only from within the guest. From here, you can do anything you like, this is a full, booted aarch64 Debian instance. So, for example, you could install a package from the extensive Debian Buster aarch64 repository, using apt-get. Note that as a convenience, from v1.1.0 of the image, whenever you install a 64-bit package in this way, a menu item for it (complete with icon) will automatically be added to the (32-bit) host's desktop menu; and you can simply select this to run it, just as you would a 32-bit app. Incidentally, this works for 'terminal-based' apps (like htop) too. For avoidance of doubt, you can have 32-bit and 64-bit versions of the same package installed at the same time (their menu items are distinct). Also, should you later uninstall a 64-application, its corresponding menu item will automatically be deleted. The trick is worked by having a systemd path unit watch for new .desktop files being added to the guest filesystem, then invoking a script (/usr/sbin/reflect-apps) to create matching .desktop entries on the host (which in turn call ds64-runner or ds64-shell -c internally, as appropriate). 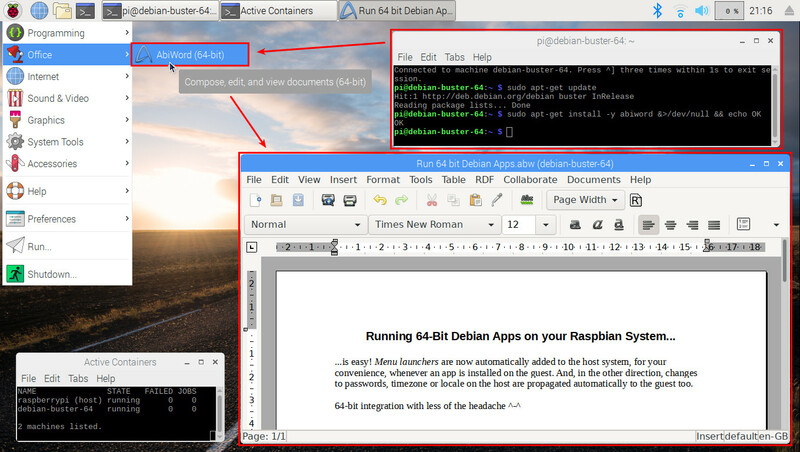 You could of course also use System Tools→Run 64-bit Program... to launch abiword, or call ds64-runner (or the slighly less user-friendly ds64-run) from a Raspbian shell. Alternatively, you could also start the target 64-bit program directly from the 64-bit shell as well of course, and that will work too, but the launched program will close whenever the shell is exited should you do so (nohup notwithstanding). So the above approach is generally to be preferred. If you have a 64-bit server process you want to run (that doesn't need graphical desktop access), you can just set up a new systemd unit on the guest (64-bit) OS directly, of course. To close a container shell, press Ctrld, type logout (and press Enter), press Ctrl] three times in quick succession, or just click the close box on the terminal window. You can have as many guest OS terminals open at one time as you like. Connected to machine debian-buster-64. Press ^] three times within 1s to exit session. As the guest OS is a fully-booted real system, you can even e.g. set up cron jobs when logged in to a container shell in this way. If you then open a site like youtube.com, you can test out playing video. You should find that audio playback etc. works acceptably, and, as the full /home directory is bind-mounted, you can download etc. successfully. As noted earlier, from v1.1.0 of the image, 64-bit applications automatically have an appropriate launcher added upon installation to the 32-bit host's desktop menu (complete with icon! ), so you won't generally have to set up any .desktop files manually (as you did in v1.0.0). Just open a 64-bit container shell, apt-get install your target 64-bit application, and you should be good to go! As the container is automatically started at boot, and consumes less than 10MiB of system memory, and almost no CPU, when not actively executing invoked 64-bit applications, you will not generally need to manually start or stop it. However, it is sometimes useful to take down the container, in order to e.g. backup its filesystem (which lives at /var/lib/machines/debian-buster-64). Bear in mind that doing this will stop any applications (web browser etc.) you may have launched from it. A few seconds later, a dialog should pop up (as above) informing you that the container has stopped. If you have a container monitor window open, the debian-buster-64 line should disappear from it, as the guest OS shuts down. 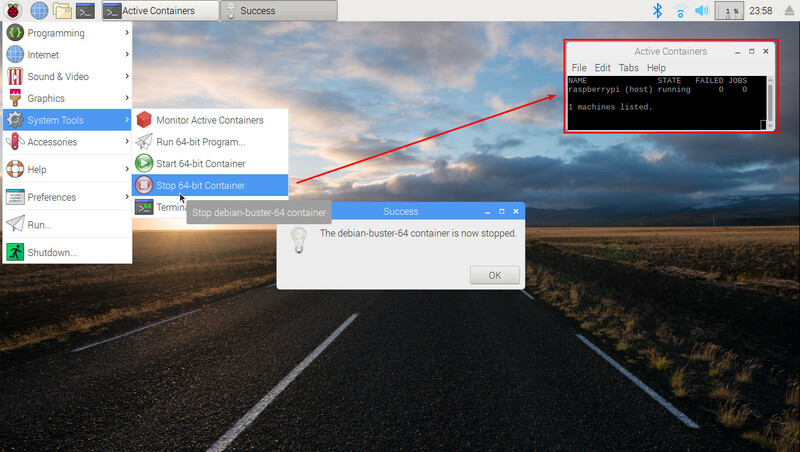 Note that stopping the container does not prevent it being auto-restarted next boot (to do that, you'd need to disable the systemd-nspawn@debian-buster-64.service). A few seconds later, a dialog should pop up (as above) informing you that the container has started. 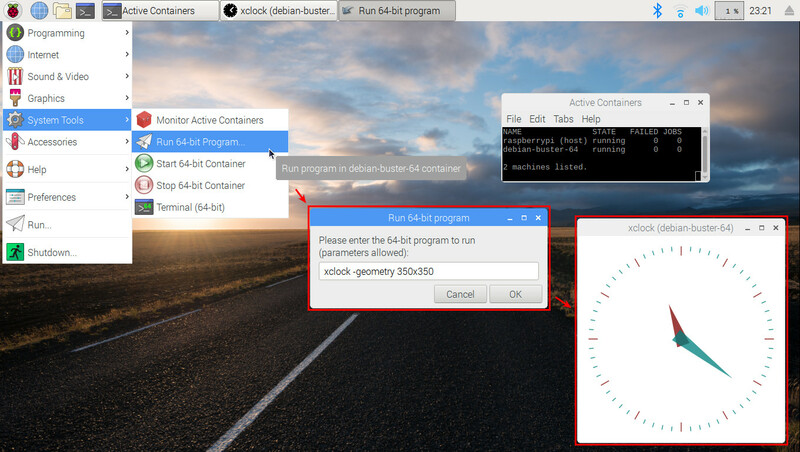 If you have a container monitor window open, the debian-buster-64 line should appear again in it, as the guest OS comes up. Once up, you can run 64-bit applications, and open 64-bit shells again, just as before. Incidentally, if you try either of the above actions when the guest OS container is stopped, they will fail gracefully, with an error message shown in a pop-up dialog box. 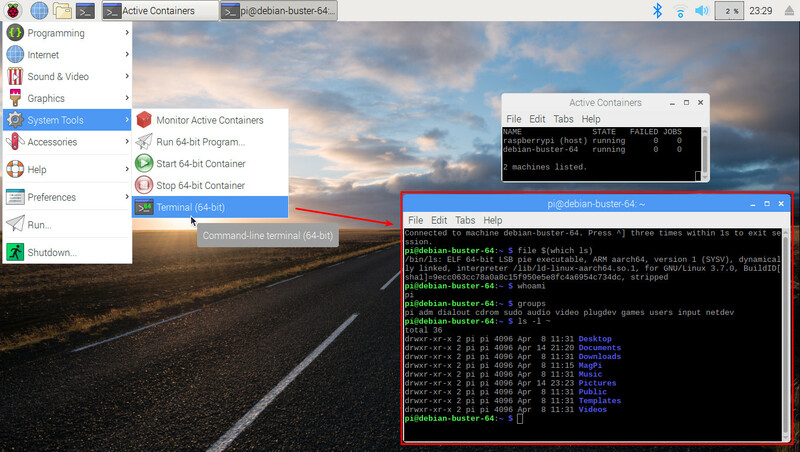 This section contains some useful command line incantations for working with the raspbian-buster-64 container; a number of these have already been demonstrated in the main text above, but are gathered here in one place for convenience. There's a lot more you can do of course, think of these just as a necessary minimum set. NB: all the below commands are issued from a terminal in the host (32-bit Raspbian) OS. Add --failed to see only units that haven't started correctly. Of course, when logged into the container, you can issue commands like journalctl, systemctl etc. directly, but it is still nice that you can use them 'from the outside'. You can then run sudo su - to get a root shell, if you need, or just elevate privileges as required for individual commands, using sudo. You can open as many concurrent container shells as you like. To exit such a shell, just type logoutEnter, press ctrld, or press ctrl] three times within a second. Operations like poweroff issued inside the container only affect the container - not your RPi3 itself. Note that issuing reboot will not work properly when the container is managed by systemd-nspawn@.service, as here; better to use machinectl (or equivalenly, System Tools→Stop 64-bit Container and System Tools→Start 64-bit Container) to stop and then start the container again. Networking identical to the host system is available (provided your host Raspbian OS has it configured), so you can ping, wget, apt-get, run web browsers etc. all from withing the container. By default, the full /home directory (only) is mapped inside the container for access. You can also issue sudo poweroff when logged into a container shell. 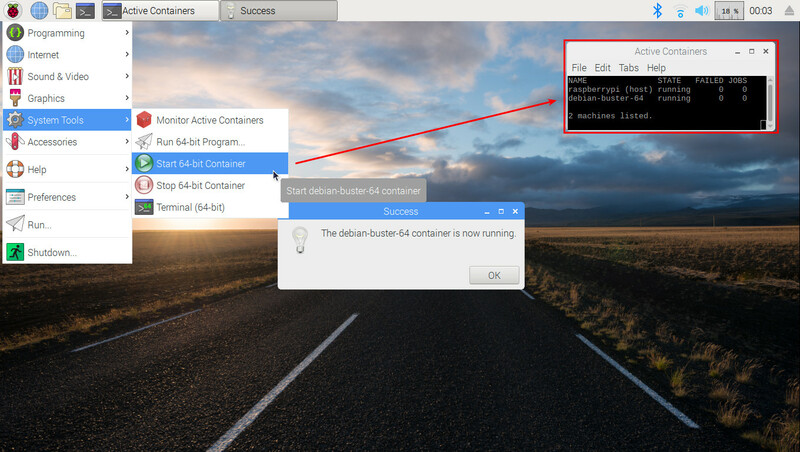 Remember, the way we have things set up, the debian-buster-64 container will be auto-started at boot, so you will only need to explicitly start the container if it has crashed, or you have manually taken it down for some reason (to take a backup, for example). pi@raspberrypi:~ $ ds64-runner firefox "https://www.raspberrypi.org/forums"
To access files in the container from the host, remember that user /home directory is already mapped inside the guest, so you can copy files via that. Otherwise, the container's root directory prefix is /var/lib/machines/debian-buster-64. There are many other options available of course. Please take the time to read the machinectl, systemctl and systemd-run manpages. Remember also that the package sets installed on the 32-bit and 64-bit (Raspbian host and Debian guest) OSes are distinct, and the two OSes must be kept up-to-date (via apt-get update / apt-get upgrade) separately. To reiterate: this is an unofficial image and is supplied in the hope it will be useful, but without warranty. will shortly be avaiable in the official Raspiban repo (thanks to ShiftPlusOne for agreeing to help out with this ^-^).